The executive secretary of Ghana Integrity Initiative (GII), Mr. Daniel Batidam, has said that corruption has cut across every stratum of Ghanaian society, such that it has become the most decentralized phenomenon in the country, sinking down into almost every home and individual. He has therefore called for an enforcement of the various mechanisms that exist for participatory action and mutual accountability to fight the social menace through what he called 'bottom-up approach'. He said the many instances of alleged corruption cited at district assembly levels, and scandals involving district level officials like chief executives and private citizens are pointers to the fact that the nation is dealing with a problem that has assumed a systemic dimension, and can only be addressed through a systematic and holistic approach. Mr. Batidam said this when he addresses participants on the first of a two-day workshop on democracy and good governance at Ho on Wednesday. Speaking on the theme: 'Fighting Corruption-An Agenda For Promoting Democracy and Good Governance' he said the scourge is one of the greatest challenges that the citizens of every country face. According to him, a Corruption Perception Index (CPI) of 2003 indicated that 90% of developing countries suffer from the devastating effects of corruption, and added that poor countries like Ghana need to take a more serous look at how to deal with the canker. "Everybody thinks of the politician or the big man sitting in an air-conditioned office as corrupt. Yes there are greater chances for those in high places to have greater access to the national cake to misappropriate it, but that does not mean they are the only ones to be blamed. It has to do with the giver and taker," he stressed. "It is an example worthy of emulation here in Ghana also, not just at the executive level, but indeed right across the decentralized system we have adopted. 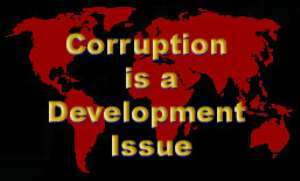 For, if there is any one important phenomenon which has been effectively decentralized in Ghana, it is corruption," he revealed. And as a way forward, Batidam called for the political will of those in authority to move away from mere sloganeering to concrete preventive actions and system-based solutions. He noted that since punishment is not the best means of halting the scourge, governments would be wasting a better part of their terms in office if they adopt the curative approach of looking for corrupt ministers in preceding regimes just to be jailed. He also suggested the promulgation of a policy that would reduce official discretion and develop equitable and meaningful wage policies because, according to him, there is a close relation between corruption and poverty; and that a fight against one automatically affects the other. Contributing, Mrs. Augustina Akosua Akumanyi, National Commission on Civic Education (NCCE) deputy chairperson (programmes) said in societies where corruption holds sway, resources for effective development are spirited away into wrong hands leaving little or nothing for the purpose. This, she said, leads to a dangerous situation, where charlatans easily exploit the situation to satisfy their own hidden agenda. "Where the poor who are always in the majority see their leaders sharing the few resources amongst themselves and living well while they starve, they will revolt," she said, and added: "opulence in the midst of poverty lends itself to temptations". According to Mrs. Akumanyi, corruption, democracy and development are never bedfellows. She therefore called on Ghanaian workers to stop stealing time at workplaces and rather spend their full man-hours in their offices to increase productivity, saying, "I do not think we are as poor as we are made to believe." For his part, Mr. Ferdinard J. K. Anku, Volta Regional NCCE director, identified the lack of capacity to challenge wrongdoing in society, especially among the powerful, as the bane of many developing countries. He pointed out that the reason for this state of affairs is the fact that the democracies of these countries are still in their infant stages, and as such the structures and systems put in place seldom bite. Mr. Anku opined that the enforcement of the Freedom of Information Act, setting up of task forces and raising the standards of living of the people, would go a long way to minimize corruption. He, however, cautioned that some of these task forces, from experience, often end up becoming goldmines for people who constitute the said task forces. This, according to him, defeats the purpose for which they were set up. During an open forum, participants brainstormed on how to drastically minimize corruption in the country and agreed that the message must be spread from the home and family level. Those who contributed included Mrs. Hillary Gbedemah of Women in Law and Development in Africa (WILDAF), Francis Quarcoo, presiding member (PM) of HO district assembly, and Torgbi Korku Ayim IV of Ziavi. Present at the workshop were Mr. Napoleon Agboada, director of education of NCCE, members of the security services, traditional and religious leaders, and assembly members. Mr. Apau Danquah, a deputy director at the regional administration, represented the regional minister, Hon. Kwasi Owusu Yeboah. Ghana Integrity Initiative is the local Chapter of Transparency International (TI) the leading global movement for fighting corruption and was established in December 1999. This year's workshop is expected to be held in every district in the country.